Pan India 3G mobile service provider Bharat Sanchar Nigam Ltd (BSNL) today announced the launch of 3 Android powered Tablets including two 7 inch resistive screen based tabs (WiFi and 3G) and one 8 inch capacitive touchscreen Tablets in association with Pantel Technologies. All 3 Tabs are made by Noida – India based company Pantel, the tablets will be bundled with special offer with 3 Months of free 2G/GPRS data usage as well as discounted 3G data plans from BSNL. The three tablets are priced at Rs. 3250, Rs. 10,999 and Rs. 13,500. The BSNL Penta T PAD IS 701R is a low cost entry level tablet solution priced at Rs. 3250 powered by Google Android 2.3 OS. It comes with a high resolution 7” resistive touch screen (TFT Display) coupled with a powerful 1GHz processor and inbuilt 256 MB RAM and 0.3MP camera. This tab is 2G and WiFi enabled so one can browse Internet over GPRS and WiFi to watch Youtube videos, check e-mail, read E-Books and much more with Android Apps. The built in 2GB memory can be expanded upto 32GB using the onboard TF Card slot. BSNL T-Pad WS704C is 7 inch 3G Tab priced at Rs. 10999 powered by Android 2.3 OS. With this Tab one can browse the Internet over WiFi or through the inbuilt 3G HSPA SIM card slot using their BSNL 3G Sim card. This tab equipped with a powerful 1GHz processor and 512MB RAM. It supports all popular video, music, and photo formats. The tablet also offers HDMI port (1080P & 720P) through which it can be connected to a TV. The WS704C has 4GB of built-in internal memory and features a microSD card slot for upgrading the capacity to up to 32GB. It comes equipped with a built-in front 0.3Mp and 2 Mega Pixel Rear camera, GPS, Accelerometer, Bluetooth and microphone. The Tab has a Polymer 4000 mAH battery. 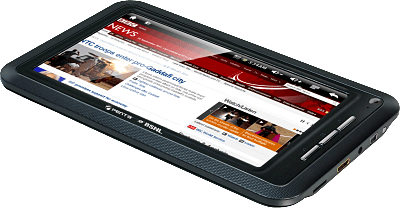 BSNL T-Pad WS802C 8 inch Android Tablet is priced at Rs. 13500 Powered by a 1.2 GHz processor and 512 MB RAM while rest of the features like GPS, camera and Bluetooth are same as the Penta T PAD WS704C. BSNL customers can buy all these Tablet from Pantel Technologies. For more details dial 1800 103 7739 (Mon to Sat, 9 am to 6 pm).